2018 saw some major developments in Halong Bay’s infrastructure. The new expressway, which links Hanoi to Halong Bay, cuts the drive time from four hours to just two. The brand new Van Don International Airport, which received its first flight in December 2018, is set to be the closest to Halong Bay. Now, the new Hon Gai International Passenger Terminal, which received its first cruise liner on November 28, 2018, has received its first cruise ship, bringing 2,000 visitors and almost 1,000 staff members to the bay. Construction began on this new port just one year ago, in November 2017, and has cost a total of $47.4 million. This massive investment into Halong Bay’s infrastructure helps to link this UNESCO World Heritage Site to the rest of the world, with the best possible facilities available for visitors. This new port was designed to receive two cruise ships at any one time, each with the capacity of holding 8,460 passengers and crew members. The port itself provides a five-star, three-storey terminal, which covers 7,600 square meters, and a harbor able to accommodate 250 smaller tourist boats. Ten international cruise liners were welcomed to the port before the end of 2018, adding to Halong Bay’s 12 million tourists expected in 2018. 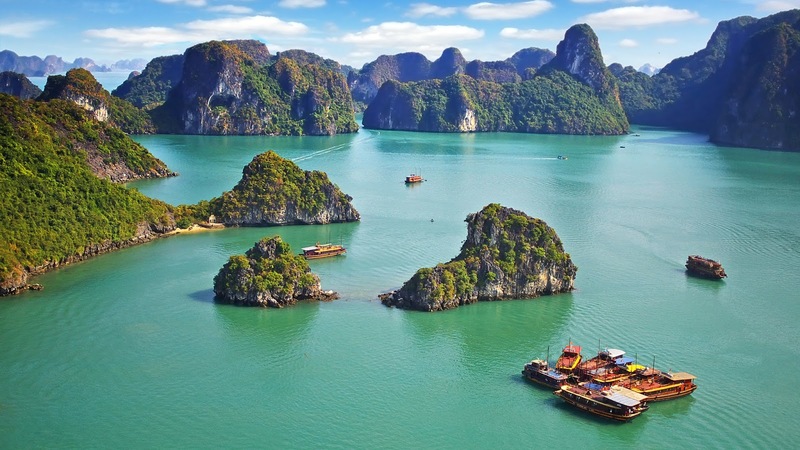 Given that the General Statistics Office stated that tourism delivered to Vietnam by ship was down 2.3 percent over the first 10 months of 2018, this port offered a welcome boost. 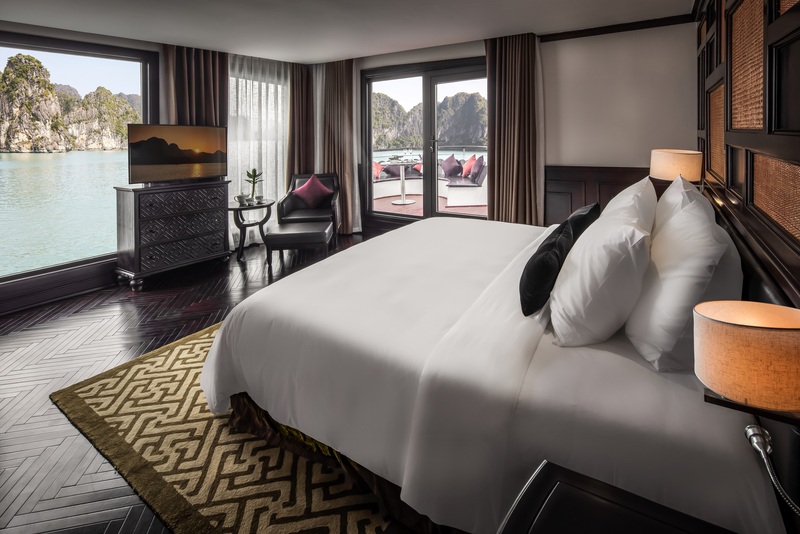 While reaching Halong Bay may have previously been a tiresome venture, new investments from the government and private companies have made the journey considerably faster and easier. 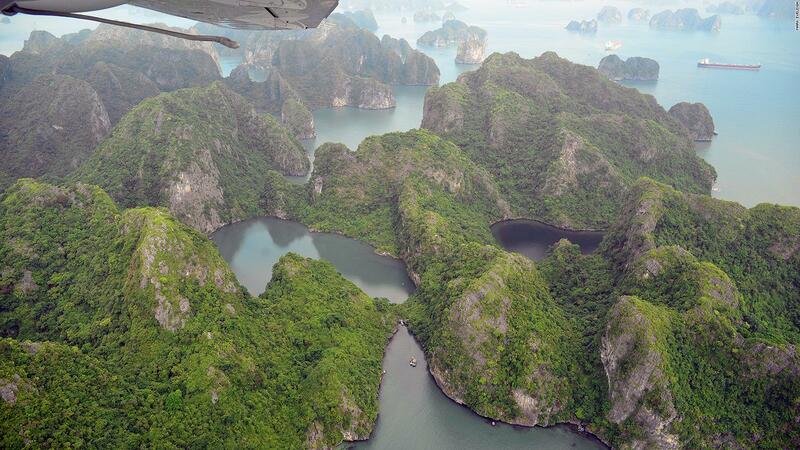 You can now access Halong Bay by three airports: make sure you choose the one that is best for you. Thanks to the recent government investment into the Hanoi to Halong Bay highway, drives to and from these locations have been cut from four hours to two – usually with a short stop in-between – making Halong Bay an accessible location from the moment you land in Vietnam. There are many international airlines flying into Noi Bai and direct flights are available. Travelers coming from a growing number of European cities can hop on a Vietnam Airlines flight direct. Flights from the US may take a little longer and usually average around 20 hours with a stop in-between. Though there are plenty of options available when it comes to travel from Hanoi to Halong Bay, some of them are best avoided. The adventurers of the world might be excited by the idea of train travel, but it’s very crowded and takes five hours to get there. While a public buses are cheap, they don’t provide a comfortable journey, leaving you stuck in a hot and overcrowded bus for hours on end. Consider hiring a minibus or car with a driver to take you there. To ensure the best service, book through President Cruises to get a private four or seven-seat car. Our drivers can pick you up and drop you off at the airport. Alternatively, President Cruises operates a fleet of private shuttle transfers daily between Hanoi and Halong Bay. We’ve got a 16-seat shuttle and a 29-seat shuttle, both equipped with on board WiFi, USB chargers, air-conditioning and complimentary bottles of water. 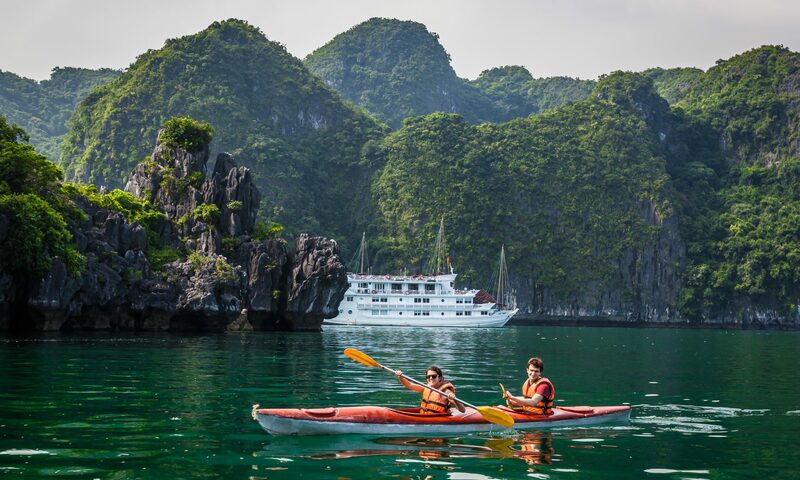 This is, without a doubt, the most luxurious way to reach Halong Bay. Our shuttle transfers leave Hanoi at 8:45am in the Old Quarter and will pick you up, though guests staying outside of the area can head to the central pick-up location at Hanoi Tower. The returning shuttle transfer leaves Halong Bay at 12:15 and drops guests to their hotels back in the Hanoi Old Quarter or at the central drop-off point in Hanoi Tower. While our limousine service does not go to Noi Bai airport, we do have a service that does – the seaplane. As a part of our special package, we offer the seaplane transfer, which departs from Hanoi airport twice a day. The seaplane can carry up to 8 people with luggage. Thanks to the arrival of the Van Don international airport, built by private investors, and the Ha Long to Van Don expressway, travelers are a mere hour from Halong Bay once they land. Even though the airport has just opened up, there is no list of international flights arriving in Van Don just yet. However, the airport was created for that very purpose, with great stretches of tarmac available for massive international airplanes and state-of-the-art facilities. Starting at the end of December 2018, flights from Ho Chi Minh City to Van Don will run daily at 2:00pm and 4:45pm for the return. The airport will open a far greater number of domestic and international flights in the future, so be sure to keep an eye out for developing news if you wish to fly into Halong Bay’s closest airport. While Cat Bi airport is an international airport, it mostly sees domestic flights from Ho Chi Minh City and Danang. Daily flights from Ho Chi Minh City to Cat Bi depart at 7:00 11:15, 12:50 and 16:55, while flights from Danang are less consistent. Unlike Hanoi, the travel options from Cat Bi are few and your best bet would be to get a private transfer, which, if booked online, will cost around $60 and take around two hours. 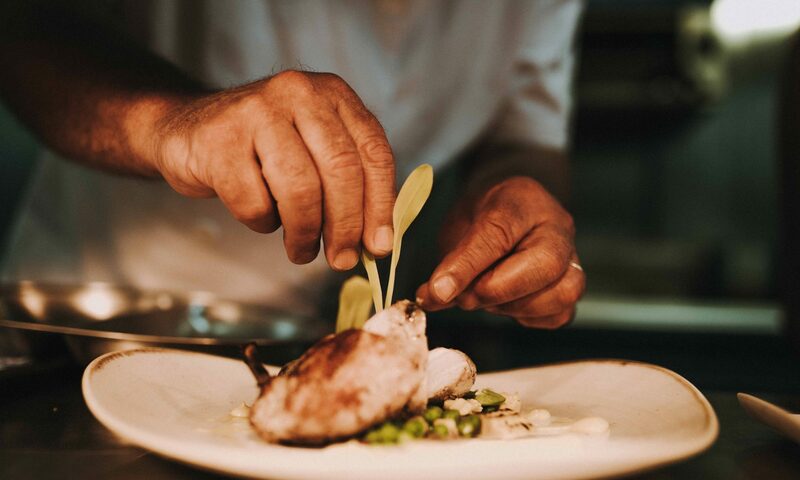 President Cruises, Halong Bay’s grandest vessel, will be hosting a Michelin star event like no other, with multi Michelin star chef John Burton-Race raising the standard of Halong Bay dining. Following this glamorous dining experience will be an unforgettable night of jazz with Brazilian duo Gustavo and Mariana in the Piano Lounge. The talented pair will conjure dreams of a 1920s New York café with their selection of bossa nova, salsa and funk. 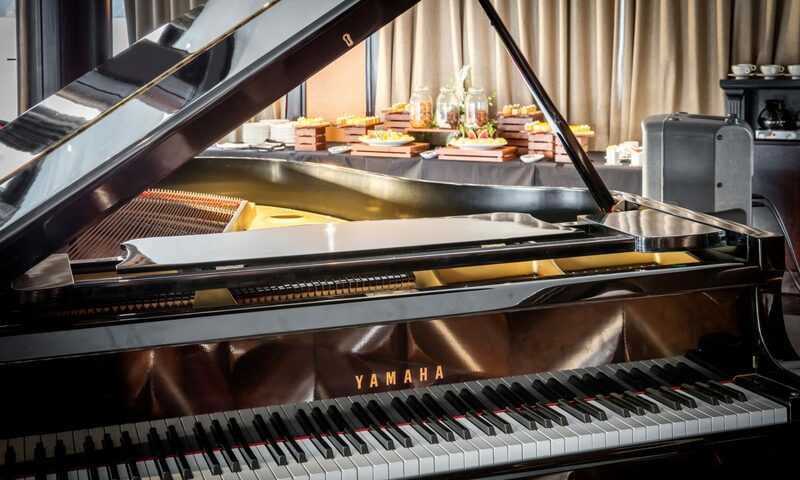 As a perfect palate cleanser to the evening’s feast of high-end dining, the jazz duo will move between an electric atmosphere and soothing beats in the luxurious Piano Lounge. Running through jazz standards that stretch throughout the 20th century, Gustavo and Mariana will throw in licks of bossa nova, Brazilian samba, and funk. That doesn’t mean that they’ll shy away from more up-tempo rhythms though. Should the occasion call for it, Gustavo and Mariana are also armed with R&B and pop songs, with vocals in English, Portuguese and Spanish. Gustavo, a well-established pianist and composer, was born in a small town in São Paulo, Brazil. At age 18, with jazz rhythms running through his veins, Gustavo attended MPB Jazz and Piano, studying under André Marques, Hermeto Pascoal’s pianist. Gustavo’s debut album, Novos Horizontes Apontam, was nominated for the 2017 Latin GRAMMY Awards, while his second album, Um Respiro, released in 2018, had the honor of including singers Filó Machado and Tatiana Parra. Lead singer Marianna Mattos never fails to bring charm and charisma to the stage. A natural performer, Marianna began singing in highly regarded establishments all over Rio de Janeiro from the age of 17, and performed as band leader vocalist on Viking Ocean Cruises in 2018. Marianna’s voice is unique and passionate, and establishes an atmosphere rivaling that of any great jazz singer. Following John’s own performance in the kitchen, Gustavo and Mariana will be found in the President’s chic Piano Lounge from 21:30 – 23:30. Make sure you see the night off with a cocktail in hand and the sound of jazz emanating from the boat – it’s sure to be an experience par excellence. Cabins, which start at $2500, are selling fast. Get in touch to confirm your spot. 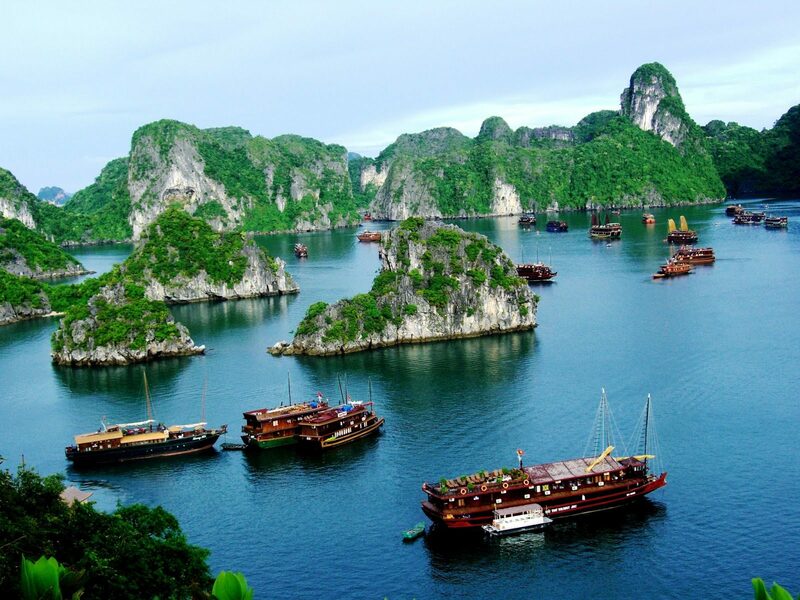 The interest in this World Heritage Site is nothing new; people have been coming to view the great limestone karsts of Halong Bay for centuries. This has been, in part, due to its unique location and an important trading post for spice trade between China, Japan, and Thailand. The bay gradually became a center for cultural and commercial exchanges between these countries and ancient Vietnam. The establishment of the Van Don port dates as far back as the reign of Ly Ang Tong in 1149. These days the Cai Lang commercial port remains a lasting relic of Halong’s ancient past. Chinese and Vietnamese tourists have been flocking to Halong Bay for centuries due to its spiritual connections. Pilgrimages became popular as people looked for soul purification and peace of mind. This is, in part due to Halong being the birthplace of Truc Lam Zen, a Vietnamese school of Buddhism created by King Tran Nhan Tong in the 13th century. 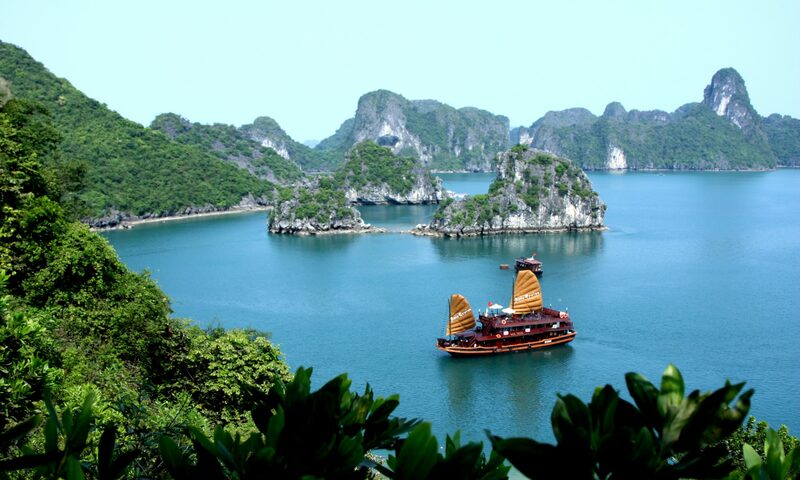 Halong Bay later became a symbol of the famous Chinese and Vietnamese junks, the traditional boat of Southeast Asia. The creation of the junks dates back to 3000BC. You can see Halong Bay’s appeal in several films that have scenes shot in the area. Blockbusters like Kong: Skull Island (2017), Pan (2015) and James Bond: Tomorrow Never Dies (1997) all contained scenes shot in Halong Bay, most of which couldn’t resist employing a junk for a scene. IndoChine (1992) is another great example of this, with scenes set in Halong Bay demonstrating the cultural significance of junks during the French Colonial period. While the history of wooden junks is rich, it’s time for a new phase of water transport in Halong Bay. It will be sad to see these beautiful ships leave, but environmental and safety factors have made replacement steel ships a necessity. Safety is an important factor when it comes to cruises and sadly wooden boats are at risk from fires and sinking. Two junks experienced major fires in 2017, while the sinking of previous wooden boats has led to worrying numbers of fatalities. 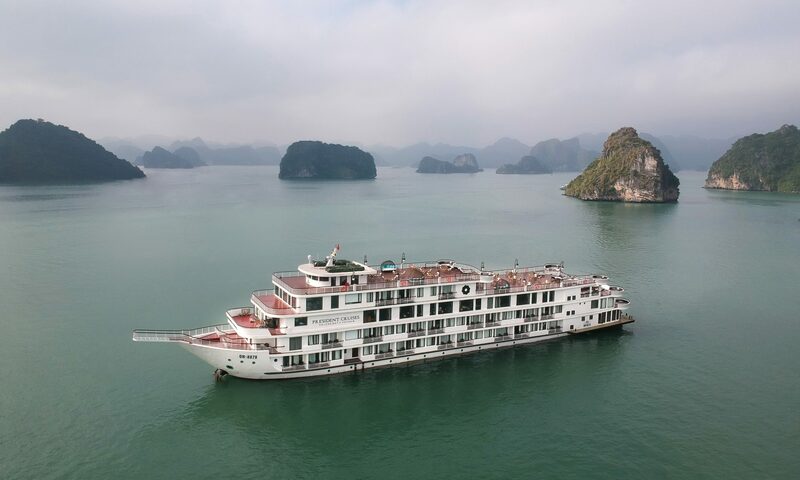 Deterioration of the boats within the harsh environment of Halong Bay has made it necessary to retire all wooden hull cruises after 15 years. In comparison, steel boats are given 25 years until they have to be removed from the bay. The environmental impact on the UNESCO World Heritage Site is another obvious factor. Deterioration of wooden boats, as outlined by their lifespan, is huge, and this can have significant negative impact when compared with their steel counterparts. Additionally, the dubious source of the wood provided for these boats may impact on deforestation in Asia. The People’s Committee of Quang Ninh is trying to reduce the number of wooden hull cruises. Currently, there are around 534 cruise ships in the bay, 81% of which are wooden. It is predicted that, by 2020, there will still be 400. But by 2030 they’ll be gone. 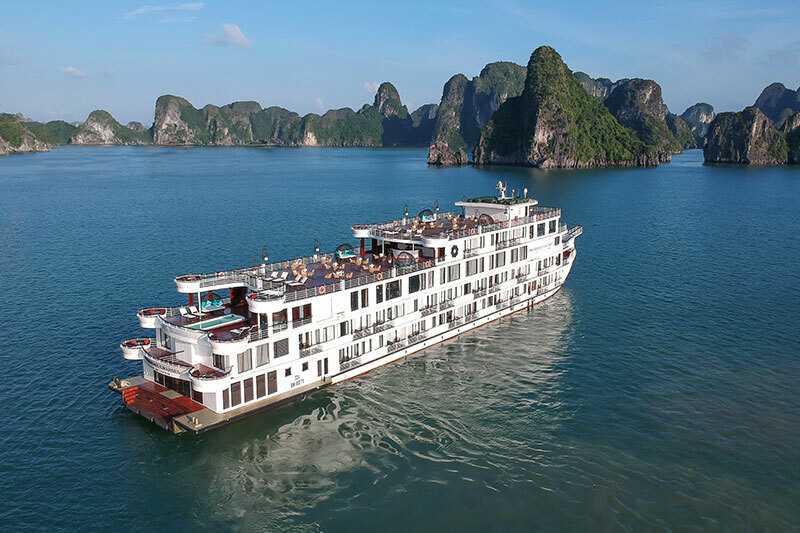 As the largest cruise liner and the market leader in Halong Bay cruises, President Cruises is proud to invest only in safe, steel boats that have minimal impact on the environment.